Article by Rebecca Brown © 8 December 2018 . Welcome back to another week of Bestsellers! Two immediate indicators that we’re getting serious about Christmas now (apart from the advent calendars and copious quantities of tinsel everywhere) are the sales figures and the appearance of The Guinness World Records, not only in the Top 10 but the Top FIVE. Bearing in mind that this has been appearing in the charts since late September, its sharp rise to the top can only mean one thing – the shopping is in earnest now. As far as sales figures go, they are pretty healthy, with the bottom of the Top 20 clocking in at over 900 sales this week and some books that are usually guaranteed Top 20 entries are knocked out – Eleanor Oliphant Is Completely Fine, which was no. 1 or 2 for weeks, is now missing out on the Top 20 despite what would usually be a healthy sales figure of over 700. However, a look back at the equivalent weekend for the last two years does show a distinct downward trend. Last year, the top 19 books were all selling over 1000 copies; this year it’s only the top 17, and that’s only just. You’re up to no. 14 before it goes over 1100. Looking again at no. 1, this year, David Walliams’ The Ice Monster, is at 4407; last year, Bad Dad (Walliams again) was at nearly 6500 and in 2016 The Battle by Paul O’Connell took top spot with almost 6k sales (Walliams had to put up with second place that year, with The Midnight Gang racking in just short of 5500). This weekend is a fascinating snapshot of the market, and the coming year should prove very interesting; it’s anyone’s guess as to whether next year’s equivalent weekend will be up or down. ‘There will not be much political writing in this or any other year that is carried off with such style’ The Times. In exploring the answers to the question: ‘why did Britain vote leave?’, Fintan O’Toole finds himself discovering how trivial journalistic lies became far from trivial national obsessions; how the pose of indifference to truth and historical fact has come to define the style of an entire political elite; how a country that once had colonies is redefining itself as an oppressed nation requiring liberation; the strange gastronomic and political significance of prawn-flavoured crisps, and their role in the rise of Boris Johnson; the dreams of revolutionary deregulation and privatisation that drive Arron Banks, Nigel Farage and Jacob Rees-Mogg; and the silent rise of English nationalism, the force that dare not speak its name. He also discusses the fatal attraction of heroic failure, once a self-deprecating cult in a hugely successful empire that could well afford the occasional disaster: the Charge of the Light Brigade, or Franklin lost in the Arctic. 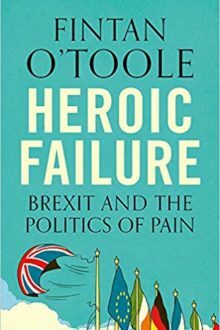 Now failure is no longer heroic – it is just failure, and its terrible costs will be paid by the most vulnerable of Brexit’s supporters, and by those who may suffer the consequences of a hard border in Ireland and the breakdown of a fragile peace.